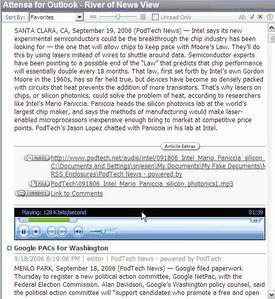 Attensa, a Portland-based company, has continued to improve upon its enterprise RSS feed reader solution which I highlighted previously, by releasing Attensa 2.0. Attensa believes that an Outlook integrated feed reader is a core requirement for large corporations. Attensa 2.0 offers all of the same features of the previous 1.5 version including the ability to leverage "attention" click stream data to fight information overload as the most influential information is bubbled to the top. Attensa 2.0 offers the ability to set desktop alerts to deliver server alerts, out of inventory updates, pricing changes or other specify needs. Attensa responded to feedback from its Attensa 1.5 corporate integrations and now offers audio and video podcasts inline. Inline audio and video enabled corporations to easily enable podcasts for corporate training and other internal uses as enclosures do not send users to external sites or intranets sites for playback. The screen-shot to the left shows an audio file being played inline. Attensa 2.0 is being offered with forum support and a PDF user guide for free! Additional support and access to the Attensa knowledge base can be purchased for $24.95 per year per client. For more information on Attensa 2.0 check out these articles on TechCrunch and the Attensa Blog.